In 1928 the band traveled to London to compete in the National Brass Band contest, the test piece was Accrington, hymn and variations. Unfortunately they were unsuccessful in winning a trophy. 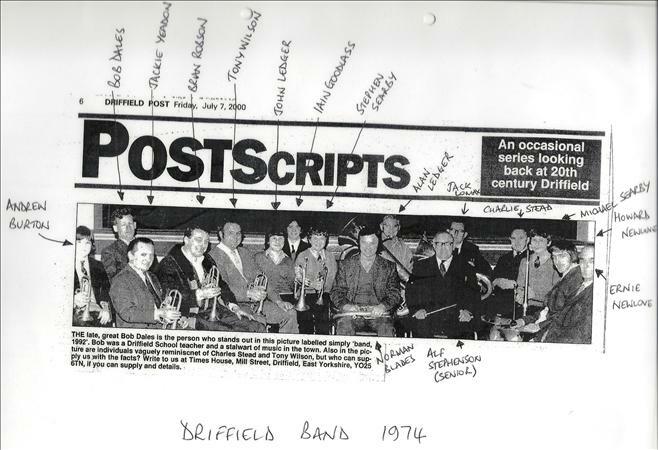 In the 1930s Driffield Band had their own contest at Driffield, on the Recreation Ground. Some local residents may have wondered what was going on, hearing bands playing in different parts of the town and some marching along to the Recreation Ground, to the contest. On another occasion the Town Band entered a contest somewhere in the East Riding and came back with three trophies. Yes, perfectly true. They won first in the march section, second in the selection, and third with the hymn. There were three bands entered in the contest. In the 1970s, the Band was successful in winning first prize playing Rural Suite at York. The conductor was Henry Crouch. 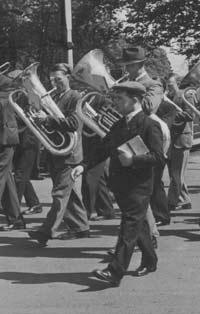 The following list of gentlemen served as Band Master, Mr George Potts, Mr Charles Wagstaffe, Gerald Ellison (a former member of the famous St Hildas Band) Mr Victor Yeadon, Mr Alf Stevenson, Mr Henry Crouch, Mr Stephen Searby, Mr Bob Dales, Mr Andrew Grace, Mr David Nichols and a return to Mr Andrew Grace. Bands seem to practice in unusual places, Driffield Band being no exception. They have rehearsed in Westgate, the Black Swan, in a garage, in a car park at the Royal Oak, Victoria Road, in a Temperance Hall, a room in the Falcon yard and from there to the Bell Hotel. 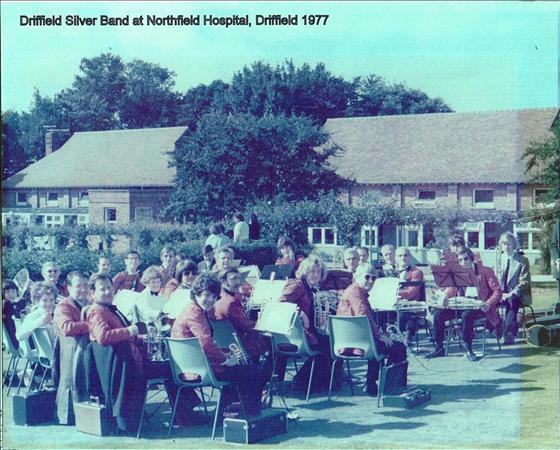 It can be said that Driffield Town Band have played in every town and many villages of the East Riding of Yorkshire. The band had a smart uniform during the early part of the century, but after the Second World War 1939-45 it was found to be worn and needing replacement. For a few years the band played without uniform, but a band without uniform does not look smart, especially on the march. In 1958 the new Secretary was appointed. At the first Committee Meeting it was decided to have a new uniform. So the first item on the Secretarys agenda was fund-raising. It may sound strange but the Secretary was given a free hand to get engagements at the best price he could. The band got their uniform and the account of 200 paid within two years. One of the engagements was to head a parade from Westwood, near Valley Bridge to Corner Cafe on the North Promenade Scarborough for the sum of 12. Of the members, there were some real characters, but they worked hard and practiced regularly. Band practice was a must and it took priority over many other things. Could they? would they? accept engagements at short notice? One Sunday morning as the band was practicing, Captain Robert Campbell arrived and asked can the Band head a Parade at Kilham this afternoon? What time? 2:30pm There was not a full attendance at practice, but on a cycle, the secretary went round to inform the others, also to order a coach. The band was there to head the parade on time. There came a time when membership began to fall; some members were getting too old, and juniors left for further education. Fortunately the band was able to accept engagements, but with the help of borrowed players. The Secretary had a book containing a list of players who could come and help us, and who were pleased and willing to do so. A small group of players managed to keep going, despite some people saying Why dont you call it a day, you cant carry on like this, but the group did carry on, they were not pessimistic. There is a saying that every cloud has a silver lining, this they believed. Mr Ronald Mustoe, Principal of the Evening Institute, came to our aid by providing a course for learners. This proved most helpful because people did come along to try to play an instrument. Some came back the next week saying that they could not play what they had previously taken, so another instrument was issued, and gradually progress was made, and the band began to grow again. History records that Driffield Town Band played on the occasion of the Coronation of Queen Victoria in 1837 and again on 10th May 1863 being the wedding of the Prince of Wales. There is also a record of Sir Tattons lot fra Malton and Driffield taking part in the first ever Brass Band contest in the grounds of Burton Constable House in July 1845. Whilst it is not known if this was an appearance of Driffield Town Band, almost certainly some members would be present at the contest. One instrument belonging to the band of those early days was the ophicleide, or Brass Horn; it resembled the bassoon in shape, had a mouthpiece like that of a trombone and was a member of the cornet family, but quite unlike the modern cornet. The ophicleide is now obsolete, though there are two in existence. Some years ago, one was hanging on a pillar in Tavistock Parish Church in Devon, the other in a museum in York. It appears that there was a change from military to brass-band, for Ross, in his history of Driffield writes that an amateur brass-band was formed in 1857. In 1860 a volunteer Rifle Corps was formed and their parades were headed by the Driffield Town Band. The local Volunteers, also had a band who shared their practice room with the Driffield Town Band, but in 1908 these Volunteers became the Territorials. Then in 1914 when men were being called up to serve the King and Country, members of the Town Band obeyed the call and with members of the Territorials became the 2/5 Prince of Wales Regiment. In 1918 after the cessation of hostilities from the 2/5 the Prince of Wales Band emerged Driffield Town Band again.